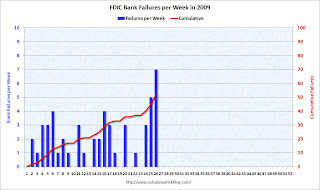 The FDIC closed seven more banks yesterday, and the following graph shows bank failures by week for 2009. 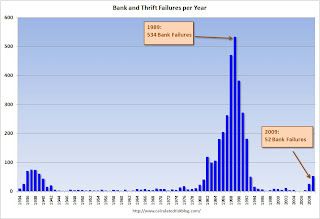 So far there have been 52 FDIC bank failures in 2009. It appears the pace has picked up lately (12 bank closings over the last two weeks). Note: Week 1 ends Jan 9th. This is nothing compared to the S&L crisis. There were 28 weeks during the S&L crisis when regulators closed 10 or more banks, and the peak was April 20, 1998 with 60 bank closures (there were 7 separate weeks with more than 30 closures in the late '80s and early '90s). The second graph covers the entire FDIC period (since 1934). Back in the '80s, there was some minor multiple counting ... as an example, when First City of Texas failed on Oct 30, 1992 there were 18 different banks closed by the FDIC. This multiple counting was minor, and there were far more bank failures in the late '80s and early '90s than this year.